locale columns: The locale header column must contain a valid locale code. At least one locale code is required for the glossary. First locale column will be used as source. part-of-speech column (optional): The part-of-speech header column, when included, should be only one of: pos, partofspeech or part of speech. description column (optional): The description header column, when included, should be only one of: desc, description or definition . terminology columns: Terminology in each row should correspond to the locale in the header. At least one term is required for a row to be valid. part-of-speech column: The part-of-speech is an informational field that indicates the sense in which the terms in the row should be used. Sample parts-of-speech include adjective, adverb, noun, and verb. description column: The description should provide any notes for the translator, including the meaning of the terms in the row. To upload to the system glossary, click Glossary menu. To upload to a project glossary, navigate to the project page, click on "Glossary" in the project page. 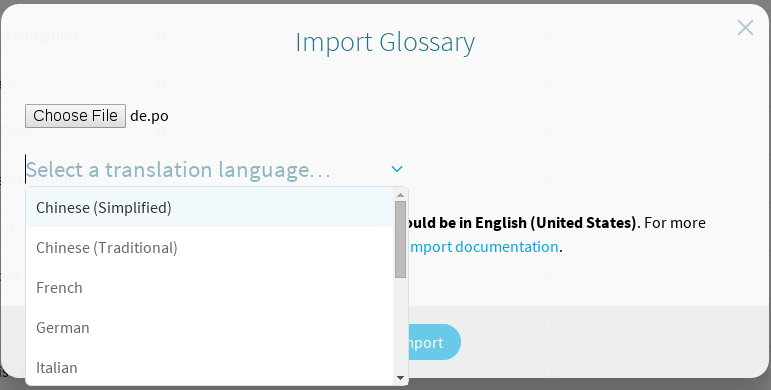 Click on Import Glossary on top right corner of the page. A window will popup, click on choose file to select your glossary file. For PO file format, you will need to select Source and Target languages of the selected po file. Click Upload button to start uploading selected glossary file. The following instructions assume that you have installed and configured the Zanata Client. Instructions for installation and configuration are available at Zanata Client Installation.